Friday was my husband’s birthday and I told him he could choose any cake from the box for his birthday cake. He couldn’t have chosen a more festive cake for the season. 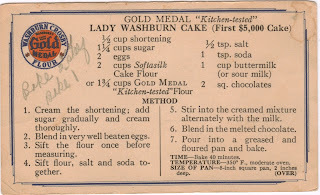 I had never heard of the Lady Washburn Cake before and when I searched the internet for recipes and photos, I found nothing. So it remained a mystery until I saw and tasted the finished product. If you’re looking for a quick cake to make for an occasion, this isn’t it. It took me a good part of the day to complete. The cake itself isn’t difficult, but the frosting takes a certain level of precision that I’m not sure I attained. It also required another new addition to my arsenal of kitchen equipment: a candy thermometer. 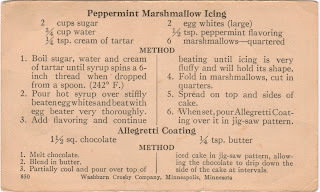 The icing directions instruct you to “boil sugar, water and cream of tartar until syrup spins a 6-inch thread when dropped from a spoon (242 degrees F).” Sounds easy enough right? I never spun a thread of any length and while I was focusing on that, the temp of the syrup rose above 260 degrees F. The frosting was really sticky, but once the entire cake was frosted and it cooled, it formed a shell over the cake. I was really worried about that, but when we cut into it after a delicious dinner with my husband’s parents at one of our favorite restaurants, Brasa, the Mmmmms and Ahhhhhhs put my mind at ease. This is a really good cake. The cake itself is light and moist with just a hint of chocolate flavor. And the peppermint is the perfect companion to that gentle flavor. It would be a great dessert to serve for a Christmas or New Year’s dinner. I have no idea what the history is for this recipe, but it has definitely found a place in our family’s holiday traditions. And hopefully by the next time I make it, I’ll have figured out how to properly prepare a boiled icing.